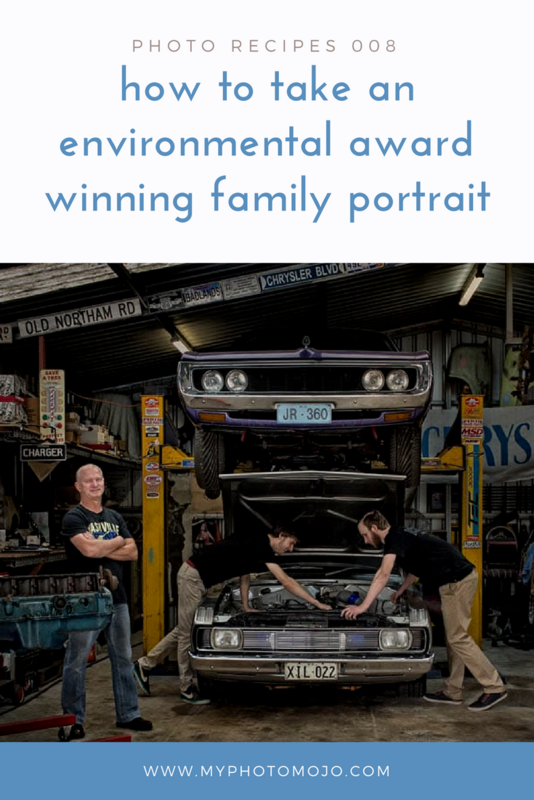 This image was a part of a family session, right from the time of booking Dad was keen to have a shot in their garage with his boys. I love environmental portraits, they offer a real window into the life of the subjects. This image won a silver award at the recent 2016 National Australian Professional Photography Awards (APPAs). As we were also shooting outside family portraits, the session took place late in the day, around 4pm. The garage door was open behind me throwing a lovely soft light inside. This was all about the them, Dad’s garage, cars and boys. They set the scene, I merely suggested where to stand and what to do. I used a tripod so I could shoot as narrow a depth of field as possible, and a wide angle lens to include as much of the garage as possible. Using my 35mm f1.2L, 1/50sec, no one was moving fast, f9, ISO1600. First I corrected the image for the distortion the wide angle lens gave on the yellow struts and roof. Then a reasonably strong HDR effect was applied to the image on most areas of the garage. I also softened & darkened the strong light that came from the roof and highlights throughout the garage. The image was printed on a matt paper that softens the effect so I went a little further digitally then I normally would.